As we explained in a previous update, the German federal government passed the draft of a law on the protection of small investors several months ago, which was meant to take account of the insolvency of the German Prokon company (that considerably affected many investors) but would also have regulated equity-based crowdfunding (even though this may not have been intended). This draft, which threatened the very existence of equity crowdfunding, faced strong criticism from the equity crowdfunding industry. Representatives of the industry, for instance Companisto co-founder and managing director Tamo Zwinge, even attended a hearing of the Finance Committee of the German Bundestag. The final version of the law, which the German Bundestag passed on 23 April 2015 and which still has to be passed by the Bundesrat, is significantly different from the initial draft and thus takes account of criticism from the industry. We welcome this decision to amend the law. Now there is legal certainty, and start-ups opting for an equity crowdfunding campaign may still raise sufficient capital. Moreover, the investment process for Companists will remain straightforward. Thus, the law strengthens the start-up investment environment and Germany's competitiveness in the digital sector. The initial draft passed by the federal government required a securities prospectus (which costs several ten thousand euros) for all investment projects exceeding 1 million euros. The law recently passed by the Bundestag, however, does not require investment projects to provide a securities prospectus unless they intend to raise more than 2.5 million euros. For investments exceeding 1,000 euros, investors will have to confirm that they can afford the investment. In other words, they will have to confirm that assets of at least 100,000 euros are easily available to them or that they are investing no more than twice their monthly net income. The maximum amount for per investment will be 10,000 euros unless a joint-stock company invests in a start-up, for instance through its managing director. Moreover, the investment information sheet included in the initial draft of the law will no longer have to be signed manually. 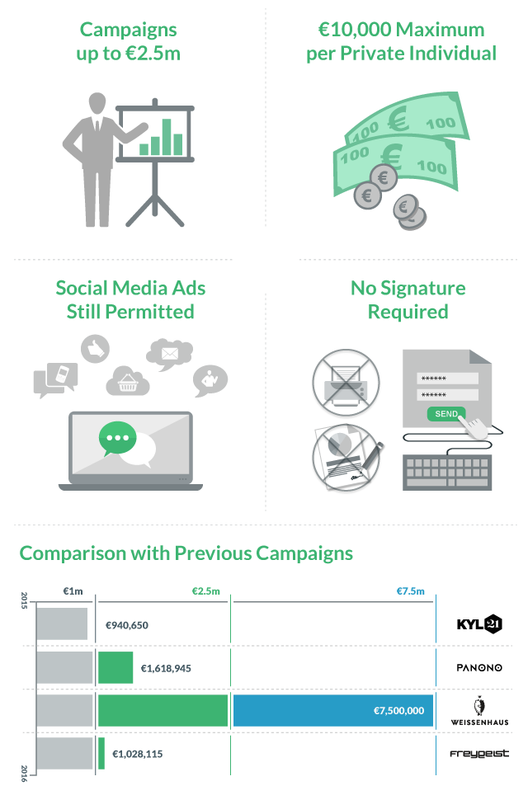 This sheet would have been necessary for investments of €250 or more and would have listed the opportunities and risks of the investment; investors would have been required to print and sign the form and mail it to the crowdfunding platform. Indeed, the current version of the law also permits platforms to have investors sign the form electronically. The current version of the law also includes a mandatory right for investors to cancel their investment. Consequently, investors may cancel their investment within a 14-day period if they have any doubts. On Companisto, this has been the case ever since the platform's launch. The initial draft of the law also prohibited advertising in social media. This provision was removed, and advertising now simply needs to include a risk warning similar to the warnings mandatory for pharmaceutical products. For more information on the history of the law on the protection of small investors, please see here, here, and here.